An explosion at a coal mine in western Turkey has left at least 201 workers dead and scores injured, officials say. 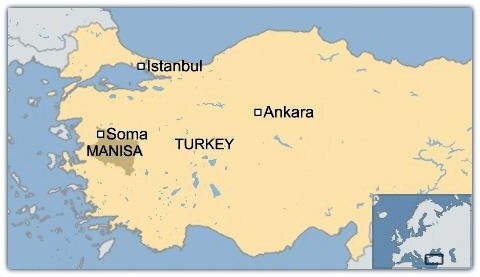 Energy Minister Taner Yildiz said 787 people had been inside the mine at Soma in Manisa province when an electrical fault triggered the blast. 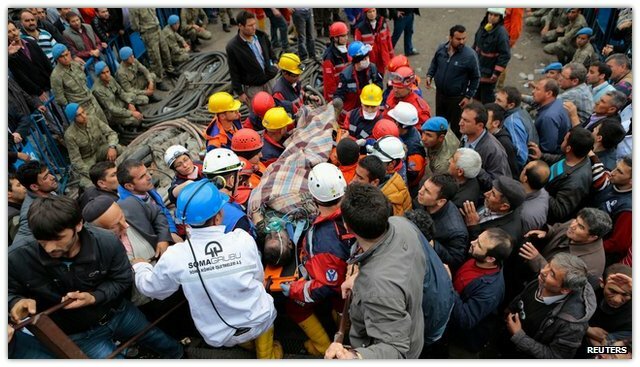 Rescuers worked through the night, but Mr Yildiz said hopes were fading of finding any more survivors. 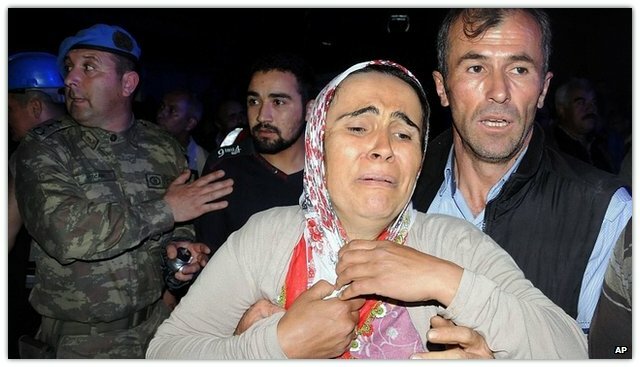 Worried relatives are gathered near the privately owned mine, about 450km (280 miles) west of the capital Ankara. Mr Yildiz confirmed the latest death toll on Turkish TV and said some 80 people had been injured. He said that of the workers inside the mine at the time of the accident, only about 360 of them - including those killed - had been accounted for. Mr Yildiz said that carbon monoxide poisoning had claimed many lives. Oxygen was being pumped into the mine to help those still trapped. He later said it was becoming less likely that anyone else would be found alive. Three days of mourning have been declared by the government. The electrical fault triggered a power cut, making the mine cages unusable. Those trapped are reported to be 2km (1.2 miles) below the surface and 4km from the mine entrance. The blast happened at about 12:30 GMT on Tuesday. Initial reports said 17 people had died but the death toll leapt later in the day. TV footage showed rescuers helping workers from the mine, their faces and hard-hats covered in soot and dust. Some were carried on stretchers to waiting ambulances. Police were keeping the crowds back to allow emergency services in and out of the area. Sena Isbiler, a mother of one of the miners, stood on top of piles of wood, anxiously craning her neck to see those being led out of the mine. "I have been waiting for my son since early afternoon," she told AFP news agency. "I haven't heard anything about him yet." Prime Minister Recep Tayyip Erdogan has postponed a trip to Albania over the accident and is to visit Soma instead, his office said. The mine's owners, Soma Komur Isletmeleri, said an investigation was under way but the accident occurred despite the "highest safety measures and constant controls". "Our main priority is to get our workers out so that they may be reunited with their loved ones," the owners said in a statement. Lignite coal mining is a major industry in the Soma area, helping to supply a nearby lignite-fired thermal power plant, but safety has long been a concern. An MP with Turkey's opposition CHP party has accused the government of rejecting a recent proposal for a parliamentary inquiry into mine accidents in Soma. Ozgur Ozel told Today's Zaman newspaper that the motion had substantial support among opposition parties. The country's worst mining disaster was in 1992, when 270 miners were killed near Zonguldak, on the Black Sea. 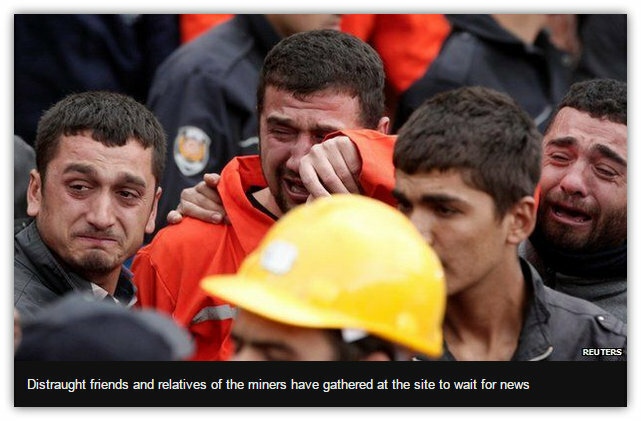 Turkey has been on edge, waiting for some good news about the trapped miners. But as the hours have passed the picture now looks gloomier. TV footage shows relatives gathered anxiously at the state hospital where the injured are taken. Ambulances come and go. At the mine itself, rescue operations continue. As a miner emerges alive, cheers erupt followed by tears. Social media is buzzing with reaction. Some complain about the lack of mine security, an issue that Turkey does not have a good record on. 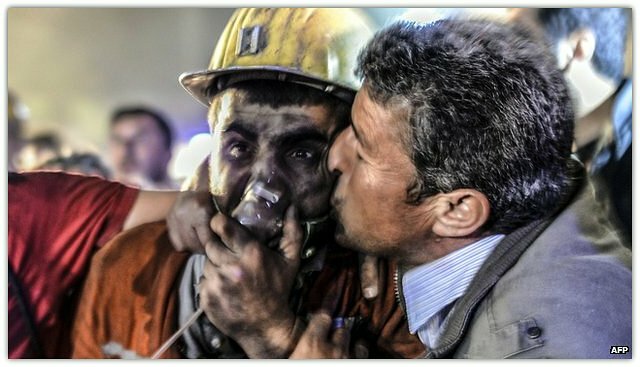 Four years ago in Zonguldak, 30 miners died in an explosion. One of the worst mining accidents took place in the same town when more than 250 miners lost their lives in 1992.